Built-in wall cabinets for the first time with the required fire resistance, as a visually attractive solution. 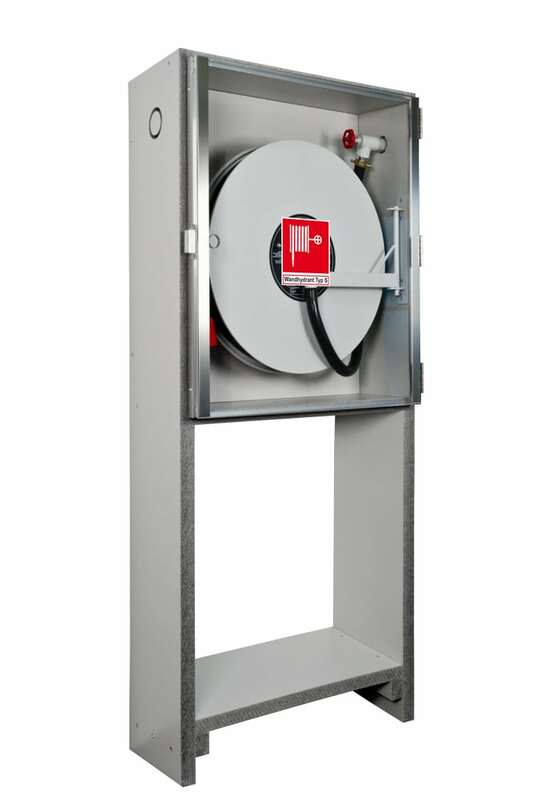 Drawing-off devices for fire-fighting water to DIN 14461 (delivery valves/hydrants) are usually installed in built-in wall cabinets so that the escape route is not constricted. This practice is architecturally more attractive than the housings mounted on the wall, which constrict escape routes. The built-in wall cabinets are mostly made of sheet steel and extend approx. 250 mm deep into the wall. They are regularly installed in shafts, in which the vertical firefighting water pipes of the building are laid. After the piping has been installed, the shafts are mostly closed off with a one-sided sheathed shaft wall 2 x 20 mm made of GRP. The built-in wall cabinet for drawing off firefighting water is then plastered flush with the surface. All sheet metal cabinets used to date form large recesses in the shaft walls on each storey. The sheet metal cabinets have neither a fire resistance nor are they smoke-tight. These sheet metal boxes make a nonsense of the piping shafts designed to be fire resistant and become a hazard in the building. Attempts to make the plastered sheet metal boxes fire resistance by retrofitting jacketing are not allowed and are unsuitable repair measures, which take the wrong direction. This is because such measures interfere with the structural integrity of the shaft wall, they are improvised and untested. The same applies to the pipe connections of the sheet metal boxes. In case of fire, it must be assumed that parts of the shaft wall break out and make the escape route unpassable. It is even possible for flames and smoke to escape and for the fire to spread on the storey. For the first time, PRIORIT offers a tested, allowable solution. This is based on a fire-resistant housing with upright supports/raised stand on the storey floor for fire-resistant of the firefighting technology. The shaft wall is structurally relieved and can therefore fulfil its separating function, especially in case of fire. Standardised pipe penetration seals of the firefighting water technology and tested connections of the shaft walls make the fire protection perfect. 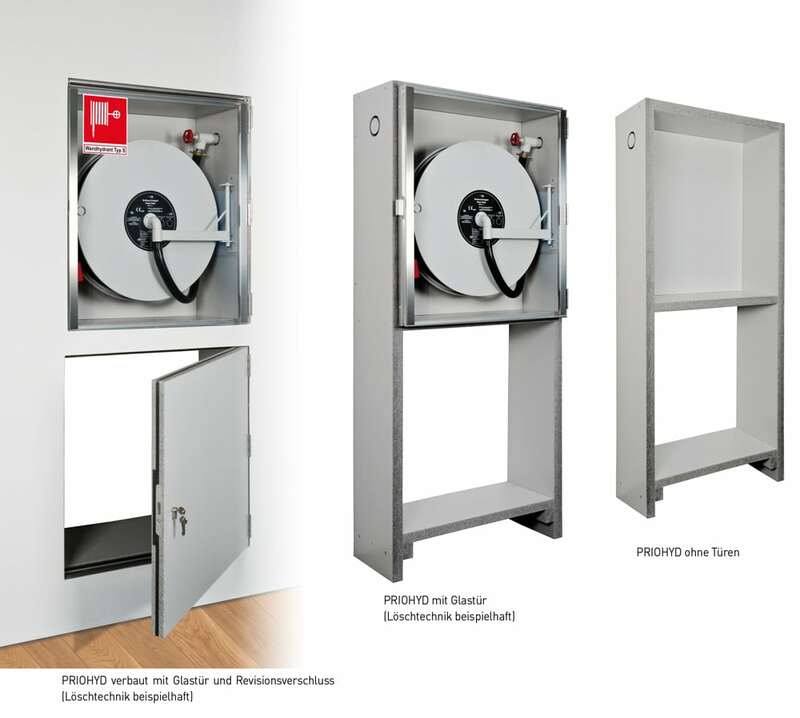 The fire-resistant PRIORIT PRIOHYD wall housing can be purchased as a housing without doors, with glass doors or with installable sheet metal housing/installable sheet metal door. A clever idea is to offer the matching inspection door for access to the shaft and the firefighting water piping as optional features. 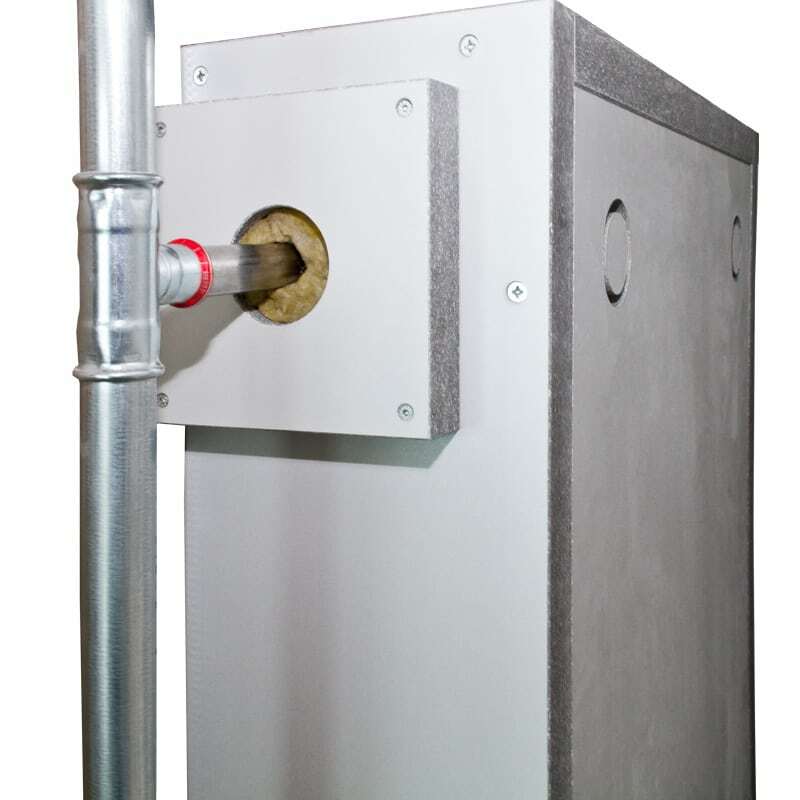 The inspection door is installed below the accessible firefighting technology in the fire-resistant wall housing. 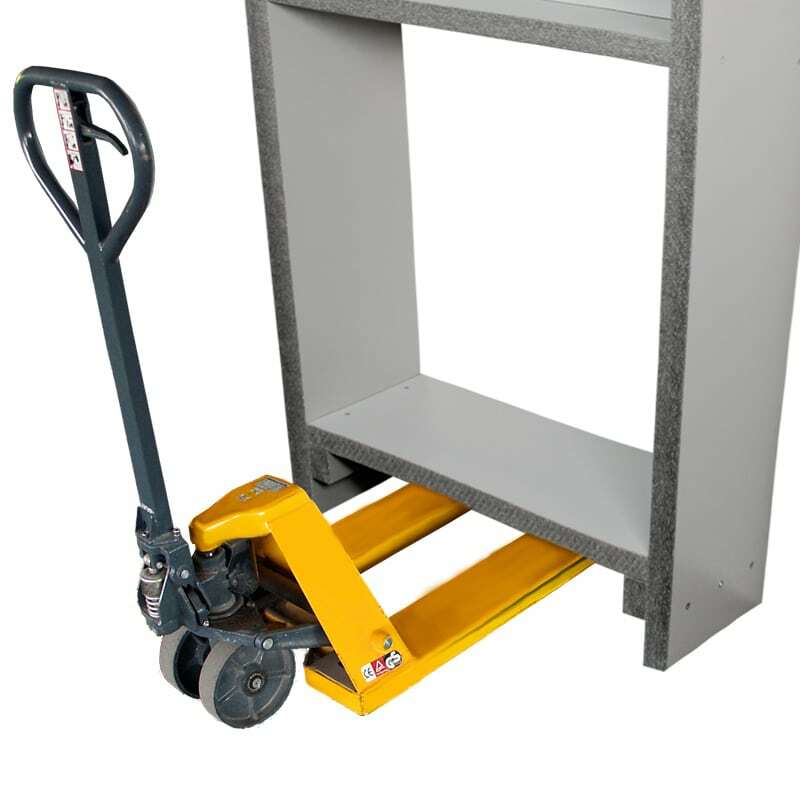 The fire-resistant PRIORIT PRIOHYD wall housing does not increase execution costs. This is because the new solution makes the construction sequence considerably easier. The fire resistant wall housings can be placed on the protrusion of the storey floor/ceiling before the piping is installed. [k1] After the piping has been completely installed the drywall contractor simply connects to the shaft wall.